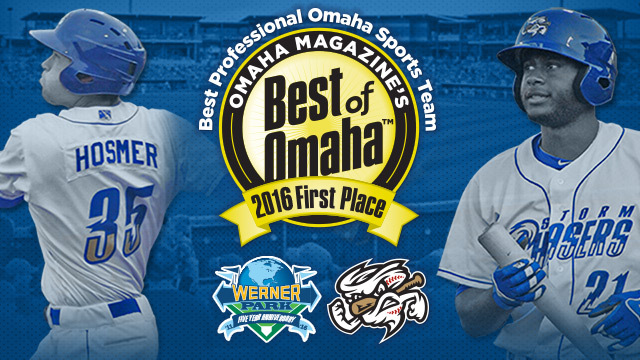 For the eighth consecutive year, the Omaha Storm Chasers have been named Omaha's Best Professional Sports Team as voted on by the readers of Omaha Magazine. The announcement comes after the club successfully hosted the First National Bank Triple-A All-Star Game in 2015, and also welcomed their two millionth fan into Werner Park. "To be recognized with the Best of Omaha Award for the eighth straight year is an incredible honor for the Omaha Storm Chasers," said Storm Chasers President and General Manager Martie Cordaro. "The fan experience at Werner Park is of the highest importance to our organization, and we continue to work to ensure that experience is the best that it can possibly be at Storm Chasers games." The eight-year continuous span in which the Storm Chasers have garnered Omaha's Best Professional Sports Team honors encompasses all five seasons the club has played at Werner Park, where the team has won four division titles, as well as three Pacific Coast League championships, and Back-to-Back Triple-A National Championships in 2013-14. Since hosting its initial Opening Day on April 16, 2011, a total of 2,061,108 fans have come through the gates of Werner Park. The Omaha Storm Chasers are the Triple-A Affiliate of the 2015 World Series Champion Kansas City Royals and play at Werner Park in Papillion, Sarpy County, Nebraska. For more information please visit omahastormchasers.com and follow us on Twitter @omastormchasers and "like" us at facebook.com/omahastormchasers. The Storm Chasers return to Werner Park for Opening Night 2016 on Thursday April 7, 2016.